The role of the multilateral development banks (MDBs) and other international financial institutions (IFIs) is back in the policy spotlight. The latest attention comes via the G20 Eminent Persons Group (EPG) on Global Financial Governance, formed by G20 Finance Ministers at their meeting in April this year. The Group, chaired by Singapore's Deputy Prime Minister Tharman Shanmugaratnam, was given the brief to review challenges and opportunities confronting the global financial system, the optimal roles for the IFIs, and recommend practical reforms to the functioning of the global financial system and how the G20 can provide continued leadership. The EPG is to provide a final report by October next year. The international financial system is significantly different to the one that existed when the IFIs (particularly the IMF and World Bank) were established. Some of the transformations include increased multipolarity (the growing importance of emerging markets and the private sector, new institutions, multinational corporations, and the influence of civil society); the rise of private capital's dominance over financial flows; and technological change contributing to financial integration and a reduced ability for states to influence factors affecting their economies. For the foreseeable future, the IFIs will also operate in an environment where shareholders have constrained public balance sheets and amid growing distrust in institutions and globalisation. Environmental sustainability and demographic challenges are two notable sources of future global pressure. The EPG will need to assess whether the mandates, operations and governance structures of the IFIs are appropriate to deal with all these developments. 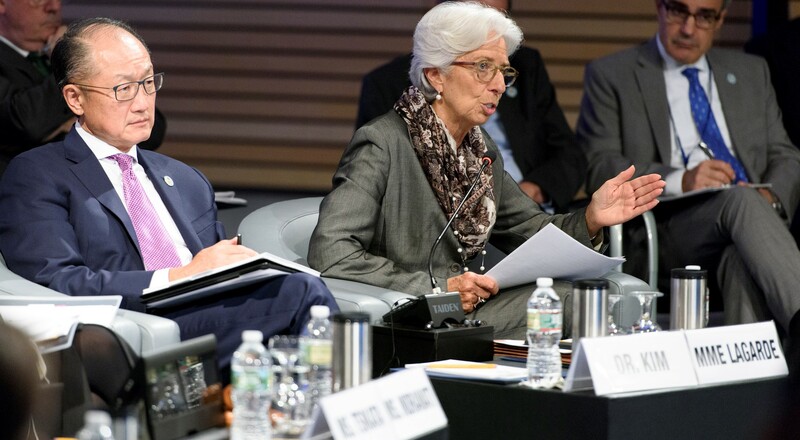 The EPG provided an initial update to G20 Finance Ministers at their meeting in Washington earlier this month. The challenges identified included attaining sustainable and inclusive growth; investment in infrastructure and human development were characterised as 'key enablers' of this growth. Sustained economic reforms and sound domestic policies 'remain critical' to strengthening the investment environment, but the financing gaps in supporting needed investment are substantial. The EPG noted, however, that there was an opportunity for far more private and institutional capital to finance these investments, particularly given private capital flows far outstrip official development finance. Another challenge identified was assuring financial stability. While greater financial interconnectedness has had many benefits, there were risks associated with volatile capital flows and exchange rates, and the transmission of shocks. What was required, according to the EPG, was an 'internationally agreed framework' to mitigate these risks, along with a 'resilient global financial safety net'. In addition to financial shocks, other processes were recognised as potentially having a major effect on growth and stability – the EPG noted pandemics, migration, climate change and cyber disruption. The IFIs remain central to the functioning of the global financial system through their provision of policy advice, financing for development, global public goods, financial safety nets and rules-based framework for international economic activity. They have responded to developments mentioned above, but the EPG must assess whether their response can be strengthened. The EPG will need to assess whether there should be a greater delineation of responsibility between institutions and greater specialisation based on comparative advantages, along with whether IFI mandates need to be updated. For example, when the IMF was established, most cross-border transactions were in the current account or through the official sector. As such, the IMF's surveillance responsibility was limited to the current account. Given the subsequent dramatic rise in private capital flows, it has been suggested that the IMF's Articles should be amended so that it has jurisdiction over the capital account. This notion was raised some 20 years ago, but was overshadowed by the Asian Financial Crisis. The possibility of an expansion of the IMF's mandate has been raised again (such as by CIGI's Jim Haley) and it will need to be examined by the EPG. In regards to the MDBs, the EPG will need to consider proposals (such as this one from the Center for Global Development) that recommend the World Bank be given a new mandate to promote global public goods, and that more traditional development banking be left to the regional development banks. There is also a growing recognition that the MDBs should be operating as a coherent system rather than independent institutions (or, as expressed by G7 Finance Ministers at their meeting in May this year, MDBs should 'operate as a system of complementary actors'). For this to be achieved, the MDBs have to attain coherence across their policies, along with their operational and shareholder positions. The latter is critical, for anyone involved in the MDBs can cite numerous examples where countries have taken very different positions on similar issues in which they are a shareholder. In terms of tapping private and institutional capital to finance development needs, this is well recognised by the MDBs, who have developed 'Principles of a MDB Strategy' for encouraging private sector financing. Many reports have been prepared on the issue, such as those by Brookings and McKinsey. However, Nancy Lee from Center for Global Development notes in an upcoming paper that progress by the MDBs has been slow due to 'a lack of collaboration within and across MDBs'; a lack of clarity on an overall strategy; the need to change incentive structures; and, most importantly, shareholders sending 'inconsistent messages' about risk tolerance, profit expectations and definitions of development impact. There is much here for the EPG to pursue. Perhaps the biggest challenge confronting the EPG is to come up with 'practical reforms', given the nationalist attitude of the US and its veto power in the IFIs. Any reform proposal that requires approval by the US Congress would be dead in the water, at least for the time being. The challenge for the EPG is to outline the desired outcome, even if it isn't immediately achievable, along with some interim reforms that head in the right direction and hopefully increase momentum for more substantial governance reforms. All easier said than done.